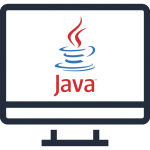 I Tech Zone is distinguished as a Java development company and service provider that provides outstanding Java/J2EE programming service assistance. Our company exclusively fulfill the requirements of miscellaneous enterprises flawlessly. The company aims its application development service to be robust and scalable with straightforward in implementation. Due to this smoother approach; Java programming language is a perceptible option for us to manage java based application development projects. Our Java developers devotedly work on a mixture of verticals including java web development and java content management systems. We fulfil desires and deliver a diverse business solution to enterprises of all categories as well as sizes. The endowed pool of Java developers and programmers at our company are highly enriched with more than a few years of experience in Java development services. We deliver extraordinary and competitive solutions specifically in lines with all the clients’ requirements along with value-added services from our end. I Tech Zone have demonstrated expertise to design multifaceted Java applications. We offer consistent and secure software web applications based on Java technology. Our enterprise applications are robust, scalable and system independent.